Why Stay at Disney World Hotels And Resorts? You can sleep in the most magical place on earth, but is it worth the cost? When you grab the monorail from the resort to the park, you appreciate the convenience. 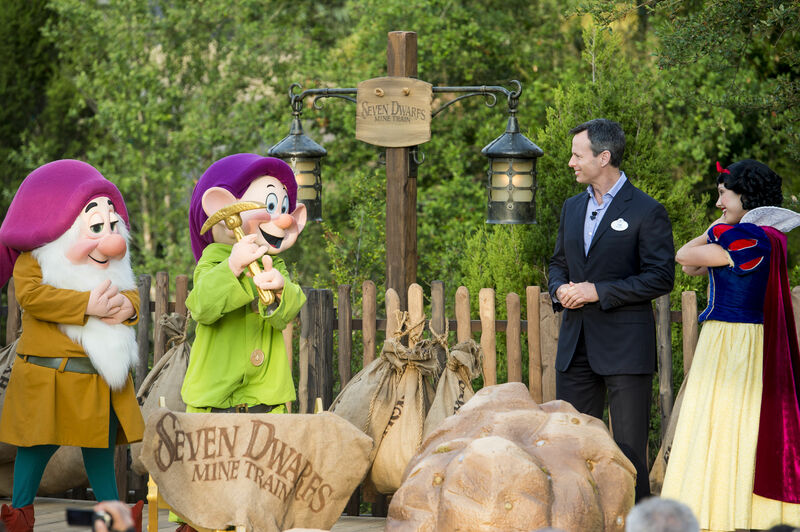 Meet the Seven Dwarfs, the latest meet n' greet characters, at Disney World's New Fantasyland. If touring Walt Disney World theme parks (Magic Kingdom, Epcot, Animal Kingdom and Disney’s Hollywood Studios along with the waterparks Disney’s Typhoon Lagoon and Blizzard Beach) is your family’s next vacation goal, take some time to select the right Orlando hotel. Location is important: your on-site “official” Walt Disney World (also known as Disneyworld or WDW) hotel might be close to the Magic Kingdom so preschoolers can take a mid-day nap, within Animal Kingdom for that “on safari” feel, or in walking distance of Epcot so teens can find fun after dark. Budget is important, too, and Disneyworld has thousands of hotel rooms in three basic price ranges: Deluxe, Moderately Priced and Value Hotels and Camping. Deluxe hotels range in price from $226 to over $500 a night, Moderately priced hotels range from $172/night, and Value Hotels start around $98/night. Campground options are also available for $52/night. These rates are per double room, depending on season and view, plus a 12.5% local hotel tax rate. The peak season winter holiday rates are 10%-15% higher. Disney also runs promotions throughout the year, especially from October through December with early booking. Look for savings of up to 30% off select Disney Resort hotels valid for stays on most nights from early October till Thanksgiving, then from the end of that weekend to mid-December. Keep in mind that most of the on-site perks apply to guests at all price point hotels, making the budget ones (fun, super themed motel style accommodations) a big value in comparison with the luxury properties. Disney’s expertise at theming extends to its hotels, and that makes them fun to visit even if you’re not an overnight guest. Each hotel or resort is like its own mini-theme park tour, due to the attention to detail in the decor; well landscaped grounds and pool areas; original artwork; displays of authentic crafts or historic objects; period or native costumes for staff or “cast members;” and availability of ethnic food at many hotel restaurants. Hotels in the deluxe category are especially worth a visit. Staying at a WDW resort grants you certain privileges which really come in handy if you’re visiting during the high season. These include extended admission hours — typically one hour earlier than the public, and up to three hours’ later — to selected rides and attractions within each park on alternating days; VIP privileges at Disney golf courses; advance dinner show and character breakfast reservations; a WDW Magic Band for charging all meals and purchases; seasonal bonus shows or activities at the resorts; or other perks. There is also a lot to do at each hotel. Don’t forget that for most families on a week-long vacation, spending all day each day in the parks is too exhausting. WDW has learned from experience that its guests enjoy and need at least one day back at the resort to relax, renew, and recharge for the continuing fun. There are even accommodations in wilderness settings at Fort Wilderness for a good old-fashioned camping trip (whether with tents or a luxury villa), complete with hiking and BBQ equipped patios. Disney’s Magical Express, complimentary transportation by private bus from Orlando International Airport, is another great perk. Families receive colorful MagicBands sent prior to departure, which can open the door to your resort hotel room, enter the theme and water parks with valid admission, check in at FastPass entrances and connect Disney PhotoPass images to your account. You can also choose to connect your credit card to your band so you can just leave your room and go without worrying about keeping up with purses and wallets. The bands also work to tag your luggage so that WDW is responsible for retrieving it from baggage claim and delivering it to your on-site hotel. That makes the transition from airplane to resort easy with kids, and enables you to go straight to the parks on your arrival day. Be aware your luggage may not arrive for up to 3 hours after arrival — but you don’t need to be in your room to receive your luggage. When you’re ready to return home, depending on the airline you are flying, a family member can check in the whole clan, pick up boarding passes, and deposit suitcases right at the hotel concierge, who will get them to the right plane on time. 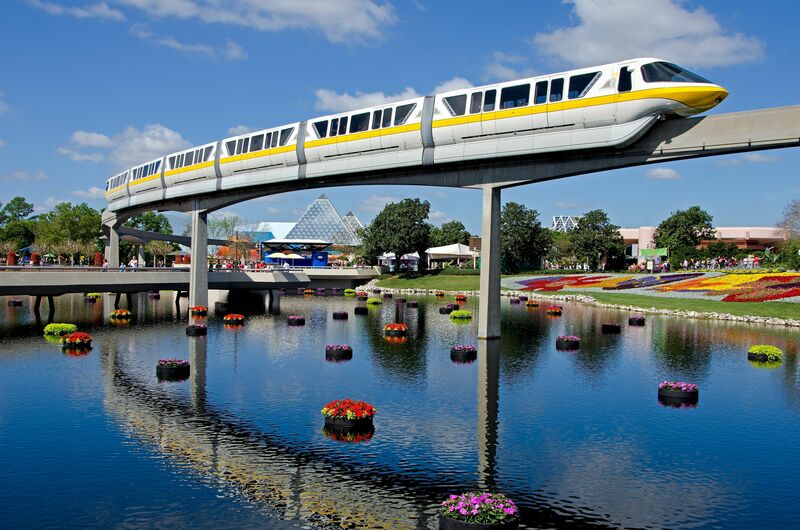 The complimentary transportation within the parks and to/from the resorts, by monorail, bus or ferry, means on-site hotel guests can save money on a rental car. This public transportation is available to all park guests regardless of their hotel. If your family plans to visit several Orlando family attractions, or would prefer to stay outside WDW for budget or other reasons, there are hundreds of convenient options. Family Travel Forum reviews several of them in detail in other hotel stories. Where to stay within Walt Disney World will all depend on your budget and individual family’s taste, and the Disney reservations agents are expert at helping guests make a decision. When choosing an accommodation, ask about swimming pools (with more or less elaborate landscaping, play areas and waterslides), food courts or theme restaurants with children’s menus, arcades, playground and other child-friendly amenities. Themes are important to consider too. Got a music lover in the family? Stay at Disney’s All-Star Music Resort and take a dip in the guitar shaped pool. Meanwhile, the Boardwalk Inn offers a throwback to turn-of-the-century Atlantic City with carnival games and saltwater taffy. It’s also within walking distance to Epcot and Hollywood studios. Every WDW hotel facility we toured was spotless and well maintained, the staff was friendly and helpful, and each had ample parking, a guest laundromat, a store for sundries and snacks, room service (if only pizza delivery at the value hotels), a nearby playground and free resort transportation. Every hotel has handicap accessible rooms and almost all have elevators. All have a main pool staffed by lifeguards and some have smaller, quiet pools without Disney staff on duty. Life jackets are available on loan, and swim diapers are required for ages 3 and under. The main differences between the price categories are the public spaces (variety of pools, restaurants, shops and facilities), size of guest room, quality of furnishings and decor, and proximity to the theme parks. 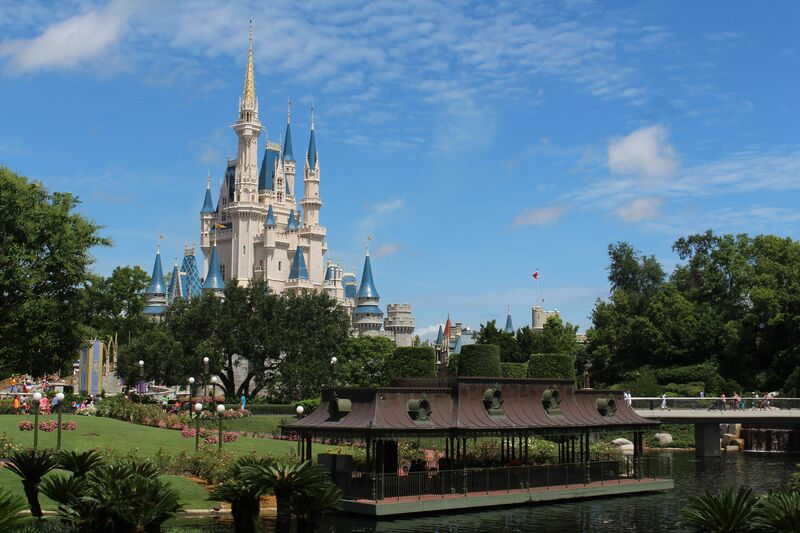 Walt Disney World is an especially popular venue for Americans, confirmed by its rank as No. 4 on the American Society of Travel Agents’ survey of “Top 10 Family Reunion Destinations.” Disney offers a program called “Grand Gatherings,” whose agents help facilitate vacation planning and connecting room requests for larger groups (five or more people) for big families, traveling with grandparents and reunions alike. The Art of Animation Resort decorated with a variety of cartoon movie themes sleeps 5 guests in a combination of a bedroom, pull-out sofas and includes a kitchenette. A standard room starts at just $132 For larger groups, the Cabins at Disney’s Fort Wilderness Resort starts at $309 a night and sleeps up to 6 guests complete with a private patio with BBQ grill and picnic table. It’s perfect for families wanting to get back in the wilderness in a secluded cabin and still have quick access to the Magic Kingdom. A variety of Deluxe Villa Resort Hotels that have Disney Vacation Club units sleeps 8 or 9 guests, and the Treehouse Villas at Disney’s Saratoga Springs Resort & Spa sleep up to 9 and start at $741. The latter is an upscale deluxe stand alone villa with views of forest glens just around the river bend. Families have plenty of room to spread out in these expanded options with private bedrooms, sleeper sofas in oversized living areas and plenty of outdoor space to play among nature’s wonders. As soon as you make some choices, work with a travel agent to secure reservations; many resorts sell out six to eight months in advance. Be sure to let their agents know if your group would like to have connecting rooms, too. As long as you prepay, they will hold them for you. Remember, there will always be room at the inn when you realize that nearly 30,000 rooms are now available at Disney World. You can call Disney at 407/934-7639 or visit Disneyworld.com to get more information and brochures. Groups needing 10 rooms or more should call (407) 828-3318 for customized information and assistance.